In the early years of the twentieth century there were those who dreamt of making Dallas a port city. 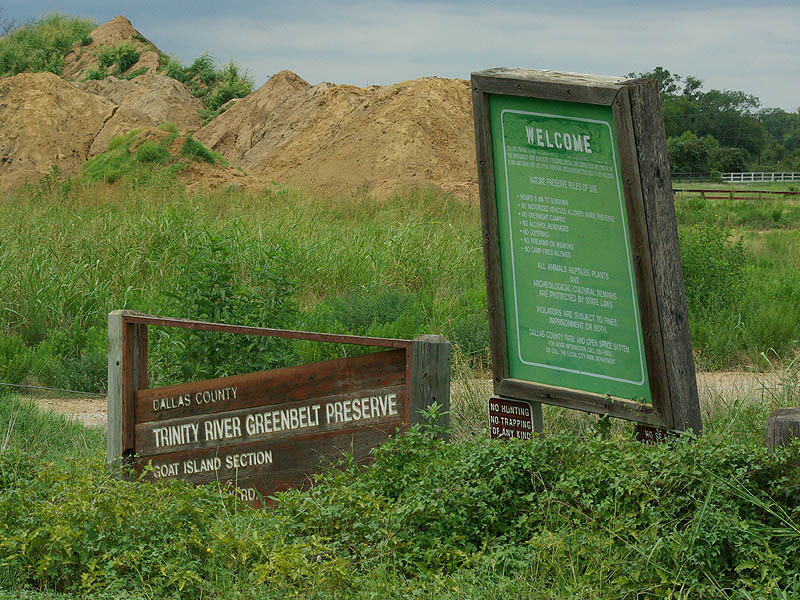 Their ambitious plans required a navigable Trinity River and steps were taken to make it so. But the Trinity is a contrary river. Shoals, shallows and snags all conspire against any type of commercial navigation. 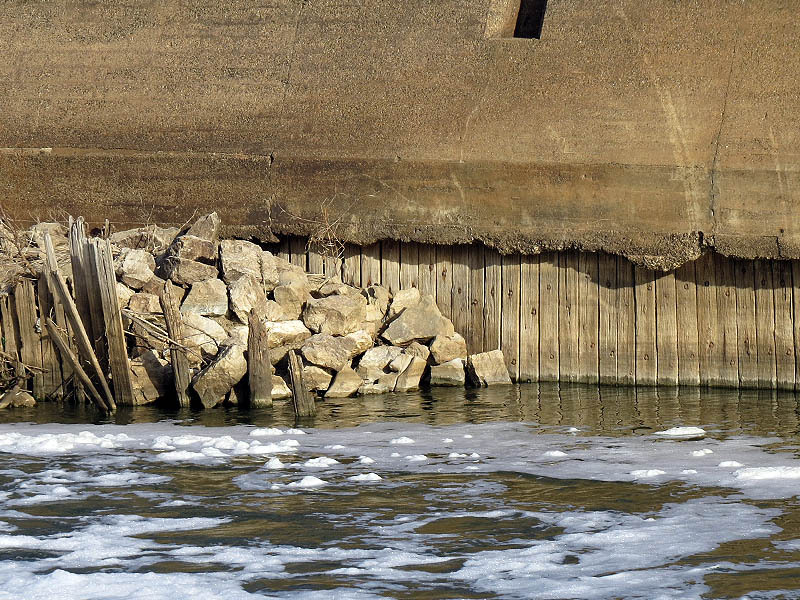 Deadfalls and other snags would have to be cleared from the river and a system of locks and dams would need to be installed before barges could ply these waters. 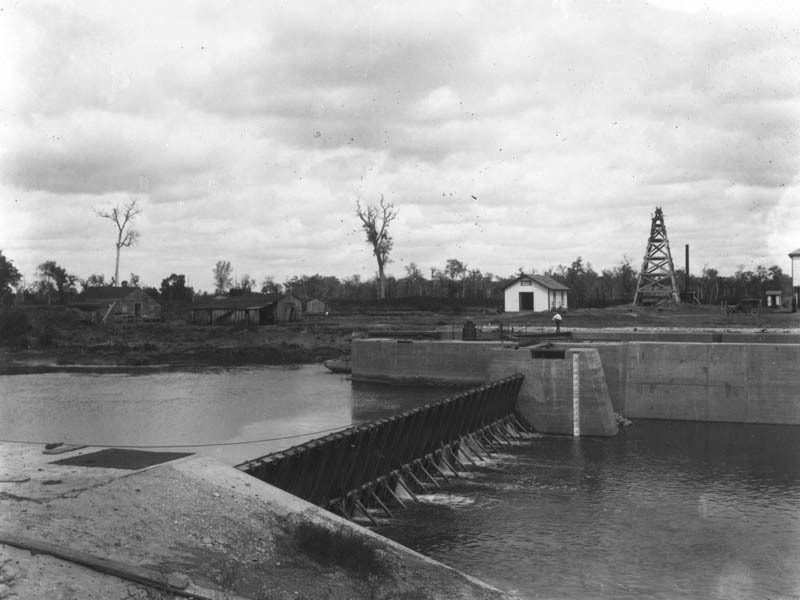 Lock and Dam Number Two circa the early 1900s. Just before the First World War began a number of Locks and Dams were built on the Trinity. Of a planned 37 only 7 were every constructed. When the United States entered the war in Europe funding for the Trinity project dried up and all off the locks and dams were abandoned. 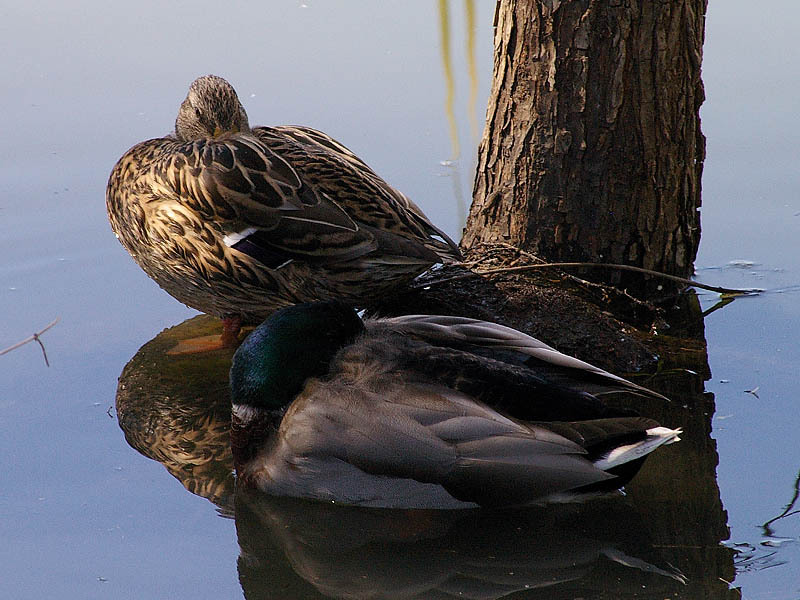 They have sat in the turbid waters of the Trinity River unused for now over a full century. In many ways I have saved the best for last. Of all of the locks and dams I have visited, this one is easily the most accessible and the most scenic. If you are interested in seeing one of these modern relics for yourself, this place might be the one for you. 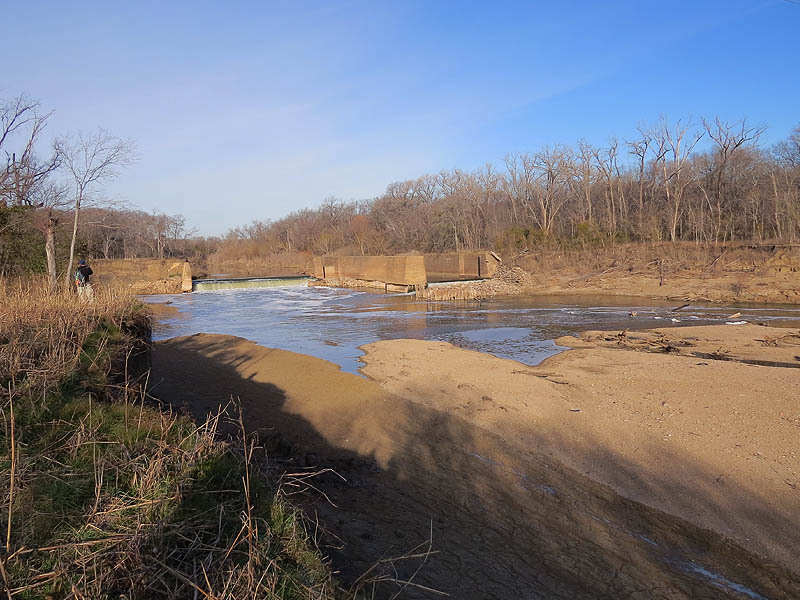 We visited Goat Island Preserve and Lock and Dam Number Two in late January. We stopped by on a brisk but beautiful winter morning. 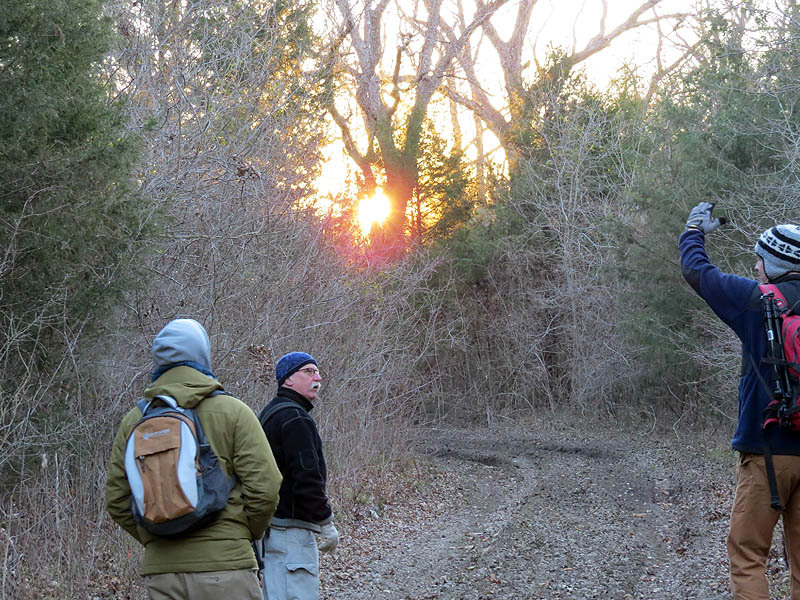 The temperatures were in the low 20s when we arrived just before dawn. 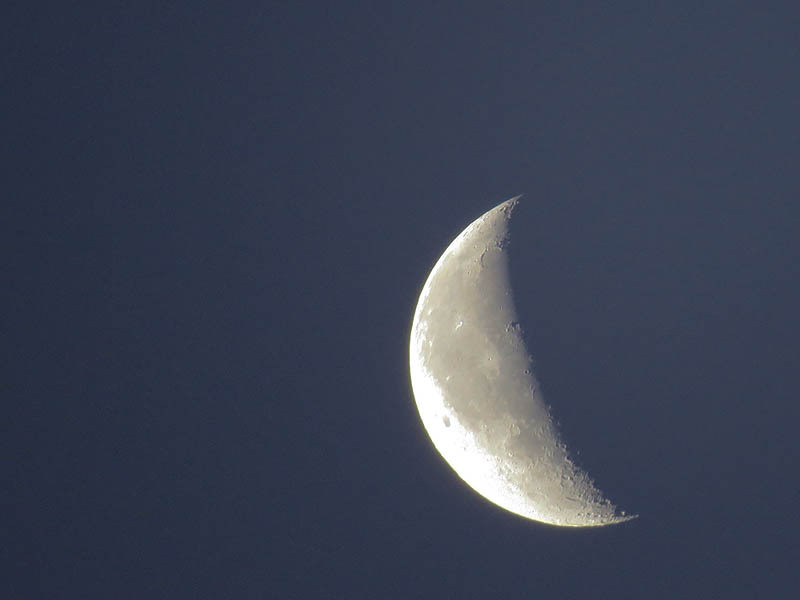 The moon was still in the sky and slowly surrendered the night as we were treated to a brilliant sunrise. 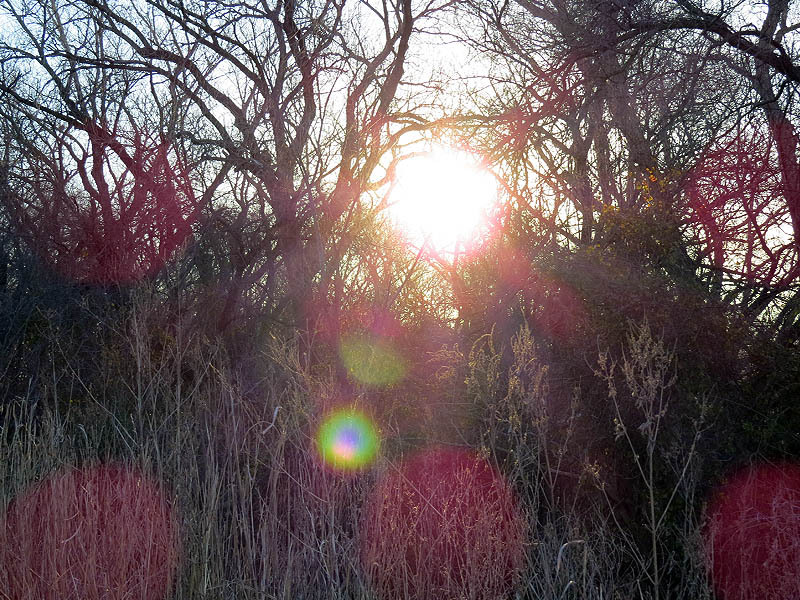 The weather would warm as the sun climbed higher in the sky. 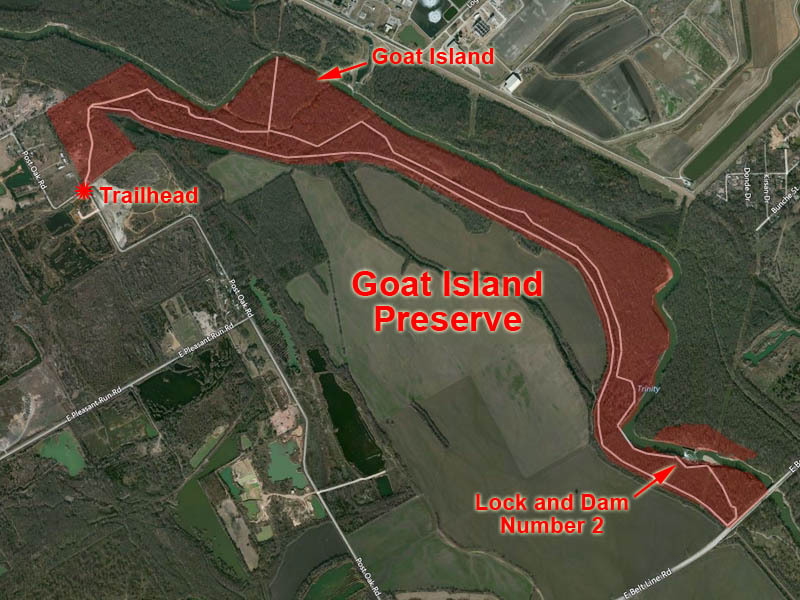 The location of Goat Island Preserve and lock and Dam Number Two. The Moon over Goat Island. 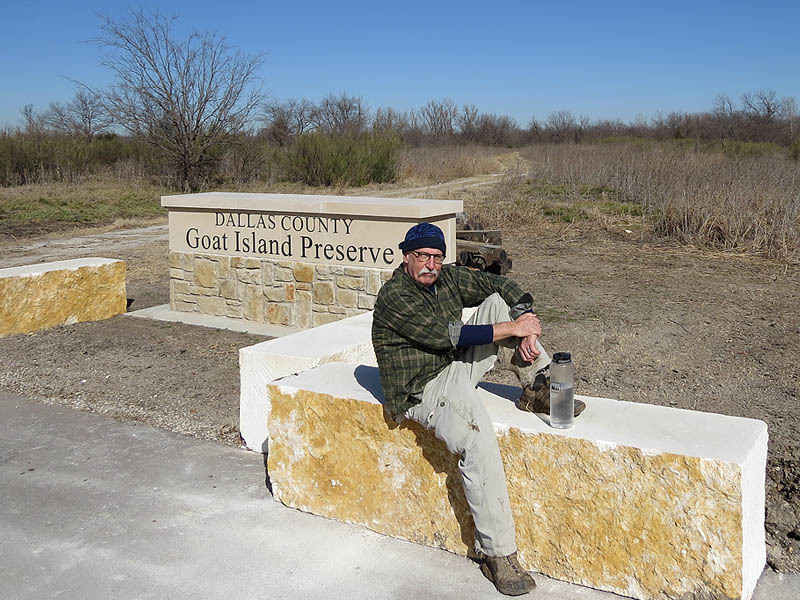 The trailhead servicing Goat Island Preserve has recently received a nice makeover. 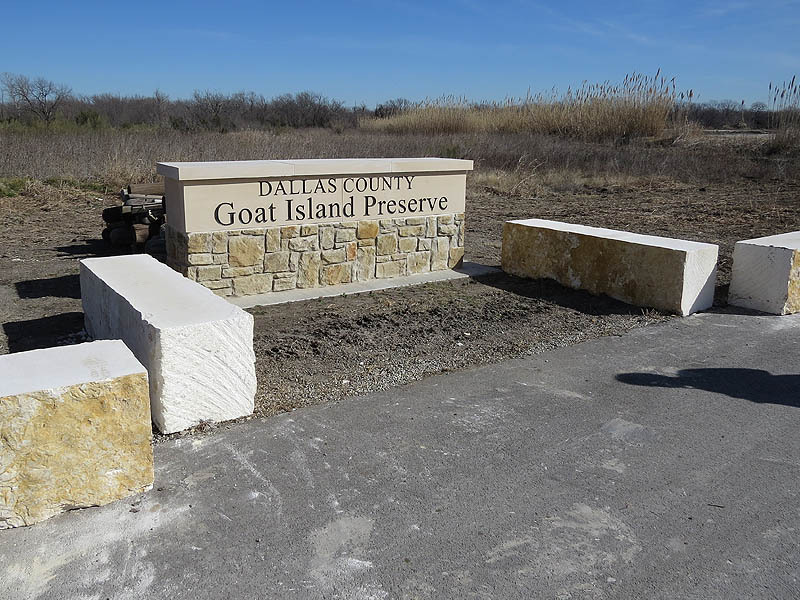 A new sign, a new paved parking lot, and big stone barriers that do double duty as benches have been installed. These are really nice improvements. The new sign and barricades. Nice improvements! This is how things looked a little over a year ago. Another sure sign that you are at the Goat Island trailhead is the unmistakable house just across the road. 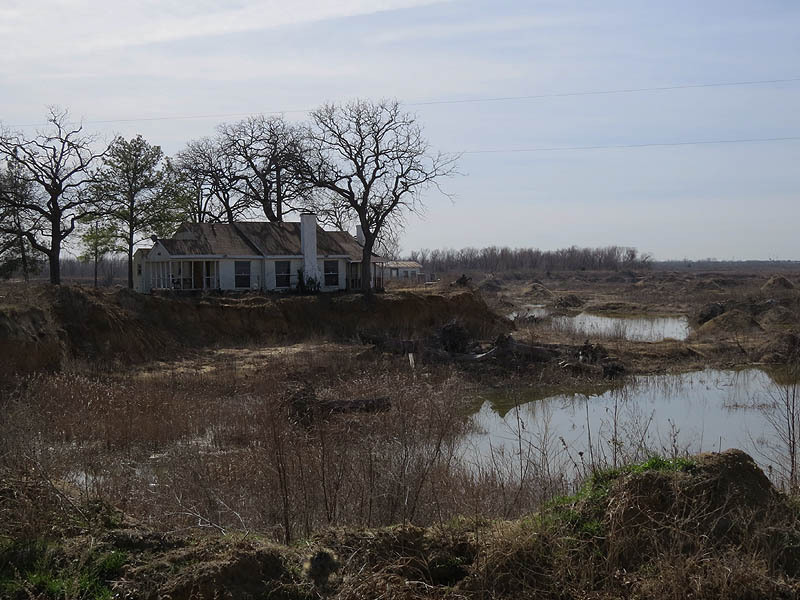 The house is located on a spit of land just barely large enough for a driveway and the house. 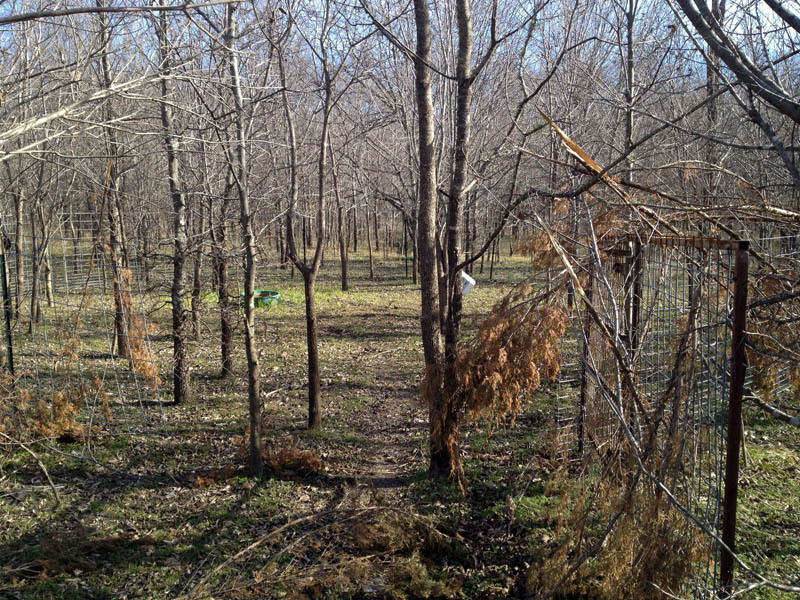 The rest of the surrounding property has been dug away as part of a mining operation. Vast empty pits surround the house on three sides. Mineral rights. A complicated issue. The frigid conditions turned out to be a blessing in disguise because they froze the ground solid. 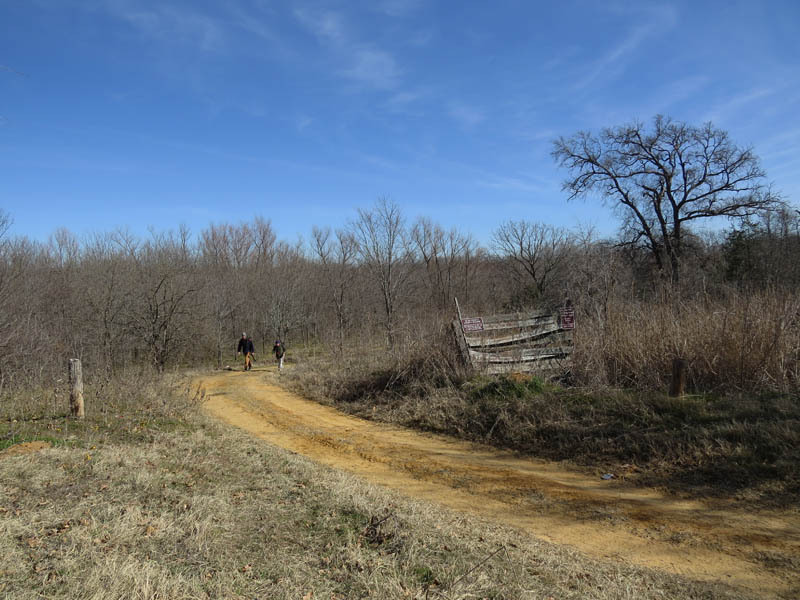 Despite the extended drought here in North Texas—whose length is now counted in years rather than months—the trails leading into the bottoms were pockmarked with pools of frozen water. 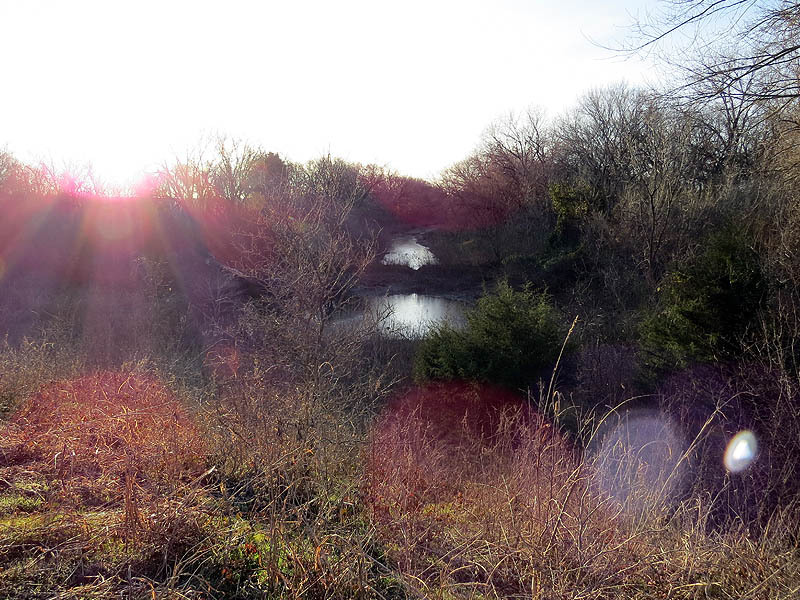 I’ve been told that the trails here are below the water table and the puddles are formed from underground seepage. With the trail frozen solid these obstacles were not difficult to traverse—we just walked right over them. Later in the day as the temperature rose and the ice began to melt passage would not be so easy. 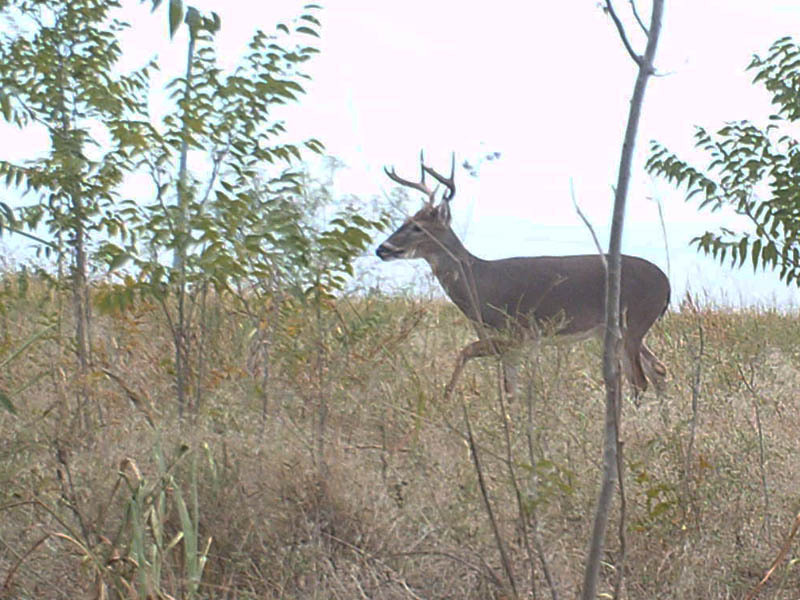 One last reminder about the no hunting and no trapping policy in the preserve. 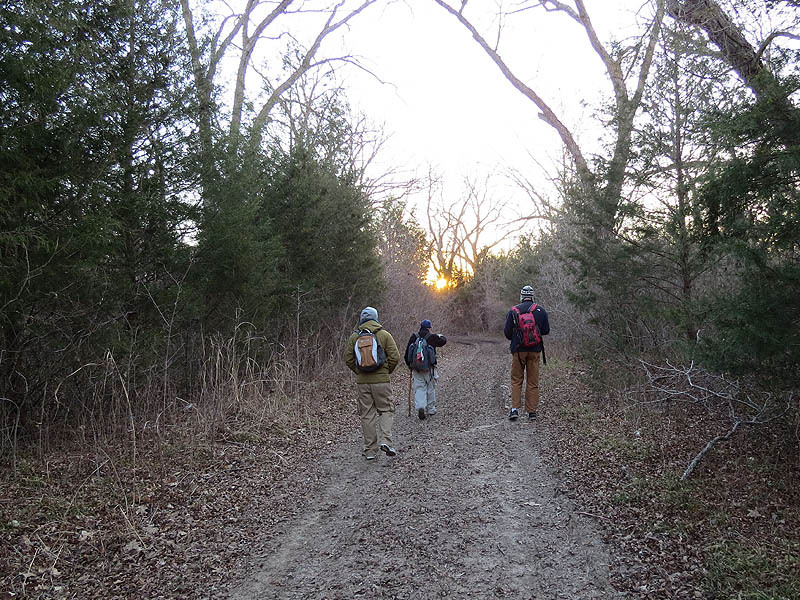 On the way to the river bottoms. 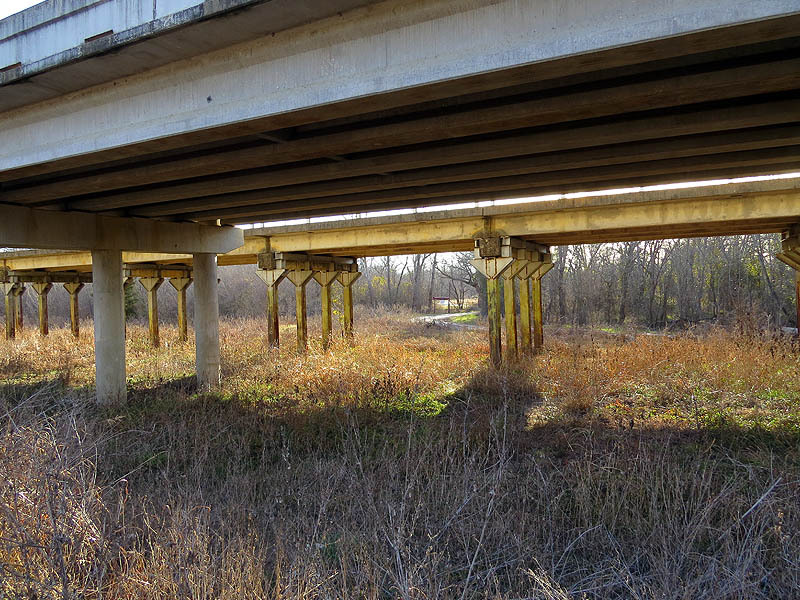 Feral Hogs are often vilified as doing serious damage to the Trinity River Basin, but the real problem is unauthorized vehicular traffic. 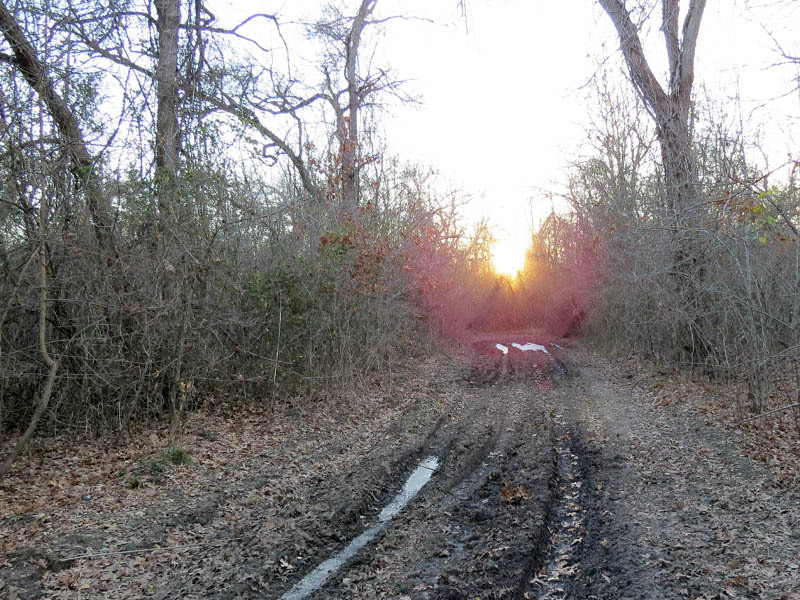 A single ATV damages trails much more severely than a whole sounder of hogs ever could. Fortunately the mud and water was frozen solid and getting by was not difficult. 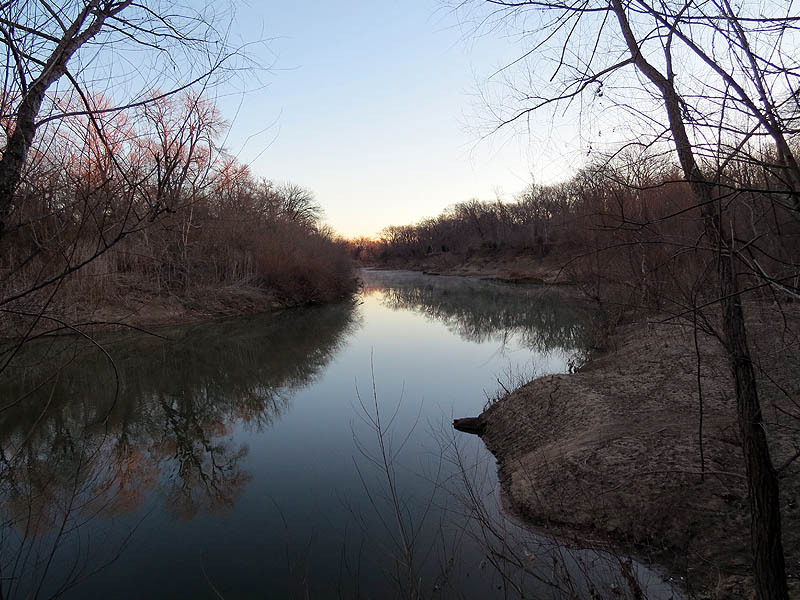 Dawn at the Trinity River. 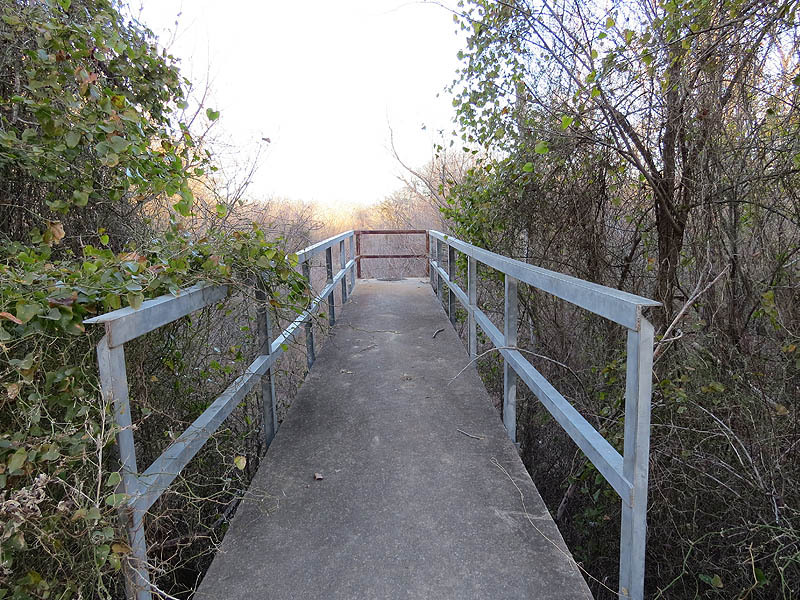 There are two sets of trails leading to Lock and Dam Number Two. 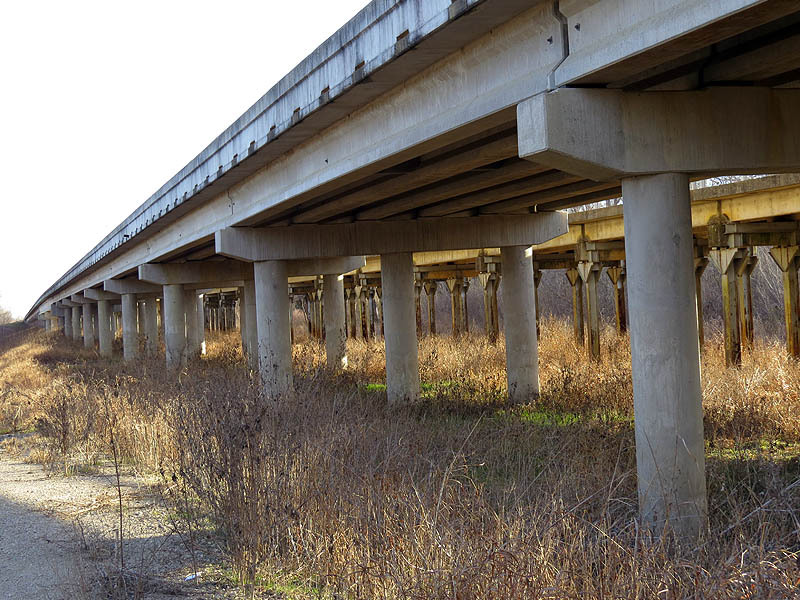 One follows the levee down to Beltline Road, and the other runs through the bottoms between the levee and the river. We decided to take the highroad on the way in and to follow the low road on the way out. The Goat Island Preserve with major trails indicated by the white lines. 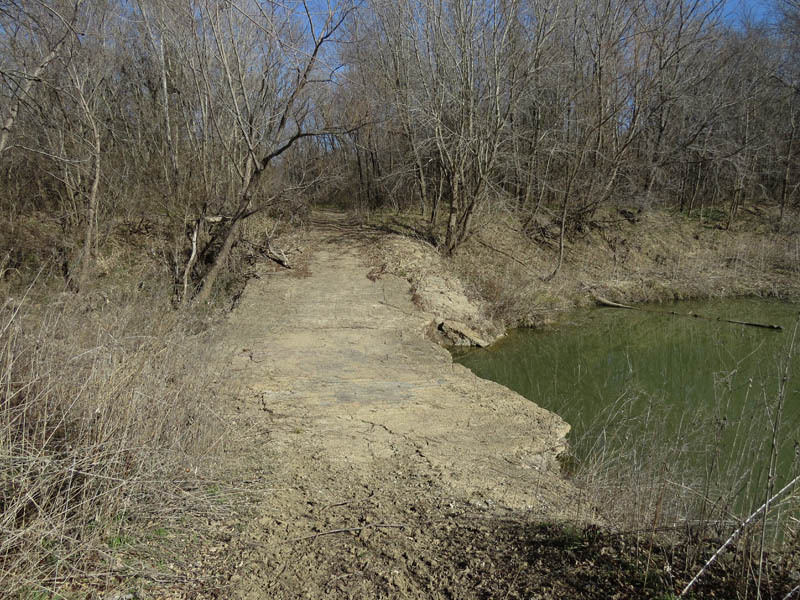 We accessed the levee at the intersection of the bottomland trail and the trail leading off to Goat Island. 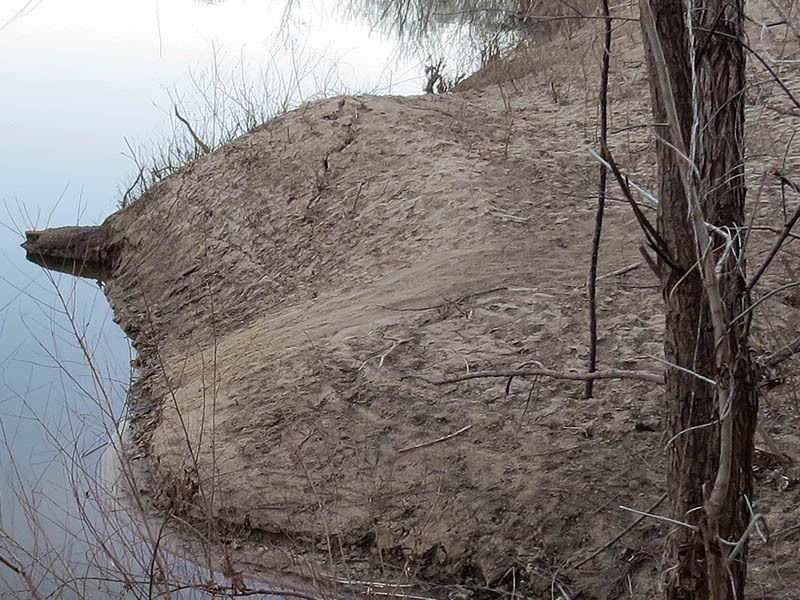 A large concrete structure is installed on the levee here and we made our way to the top of the berm at this spot. From here it was an easy and scenic hike to Beltline Road nearly two and half mile to the south. 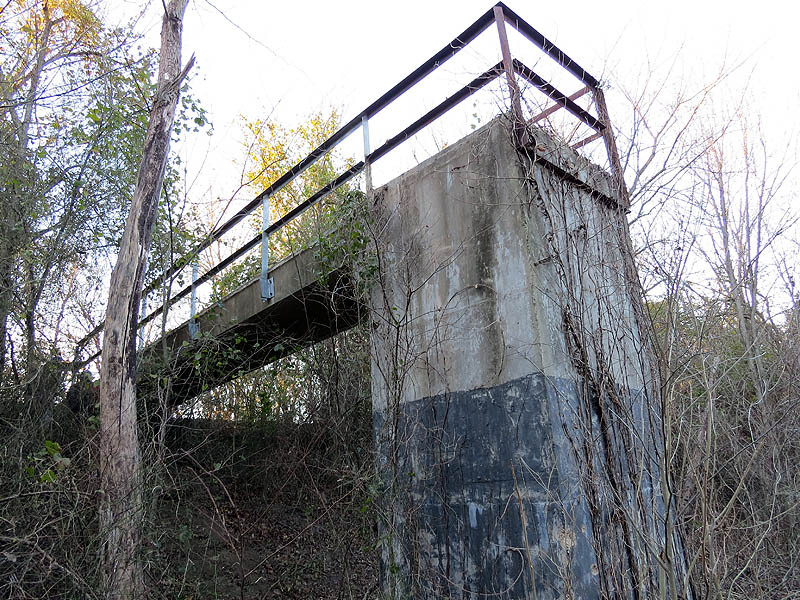 This is where we accessed the levee trail. 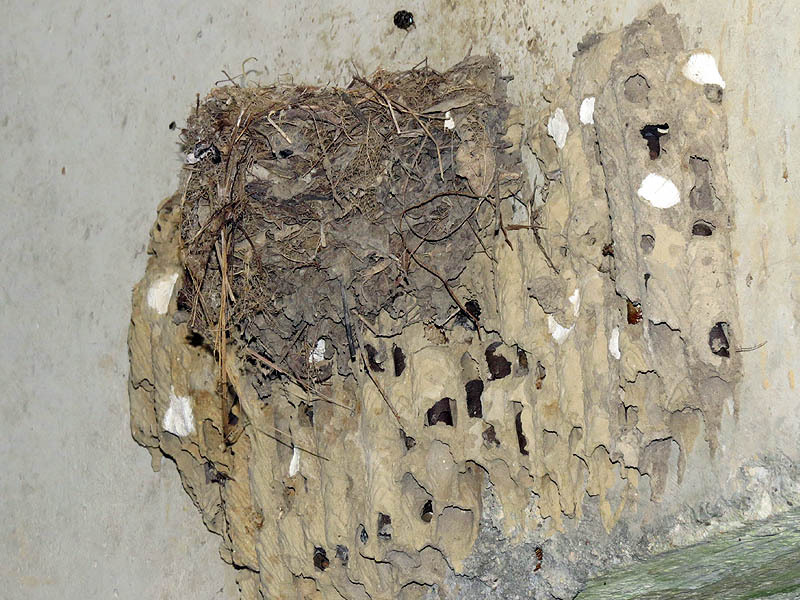 An odd juxtaposition of a swallow nest built on top of an old mud dauber nest. A look from the top of the levee. Heading south on the levee trail. The view from the levee top. Approaching Beltline Road you might notice some very no nonsense signage on the opposite side of the road just under the bridge. From what I understand these signs mark the entrance to an anything goes shooting range from which you are liable to hear large caliber or full auto gun fire (or both). 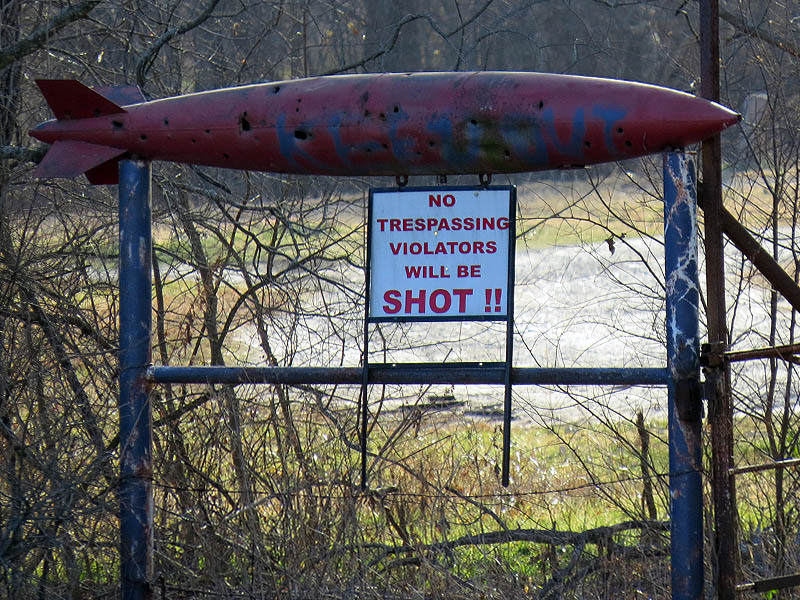 All was quiet when we passed through, but it is probably prudent to exercise caution at this spot. At a bare minimum the signs should be honored. Compare the newer bridge on the left to the older bridge on the right. From Beltline Road it is just a short walk to Lock and Dam Number Two. 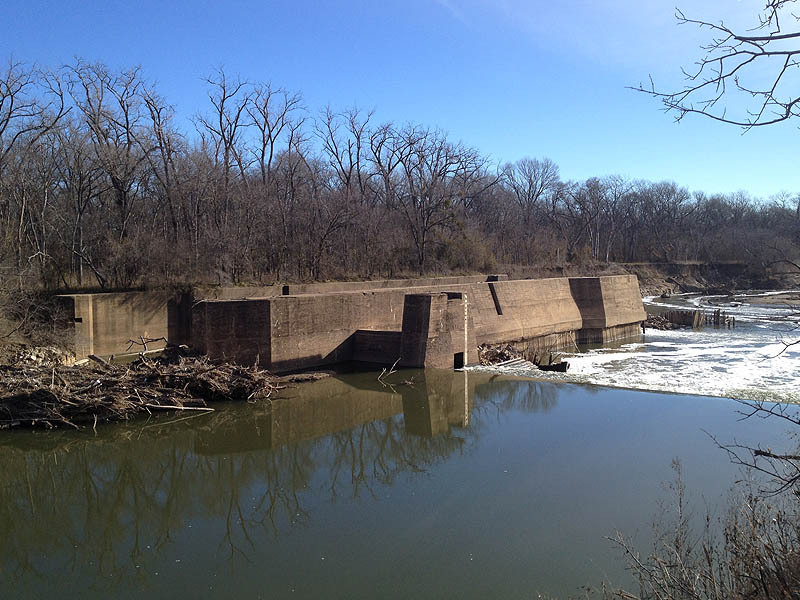 As I mentioned earlier, this is easily the most scenic of the three lock and dams in Dallas County. The sound of roaring water flowing over the dam created the ambiance of a natural waterfall. 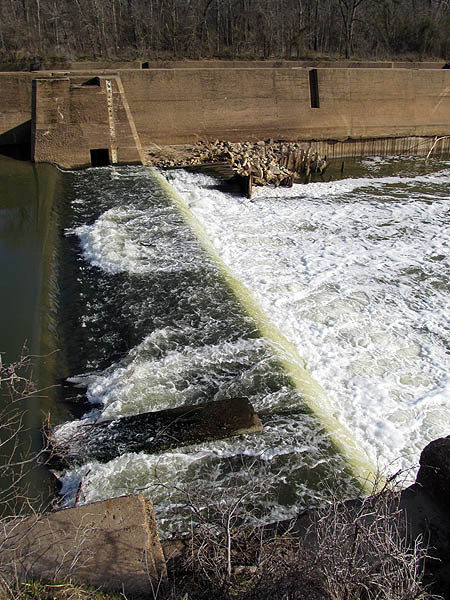 A large basin has formed just below the Lock and Dam allowing for panoramic views of the century-old structure from high above the river. Lock and Dam Number Two. 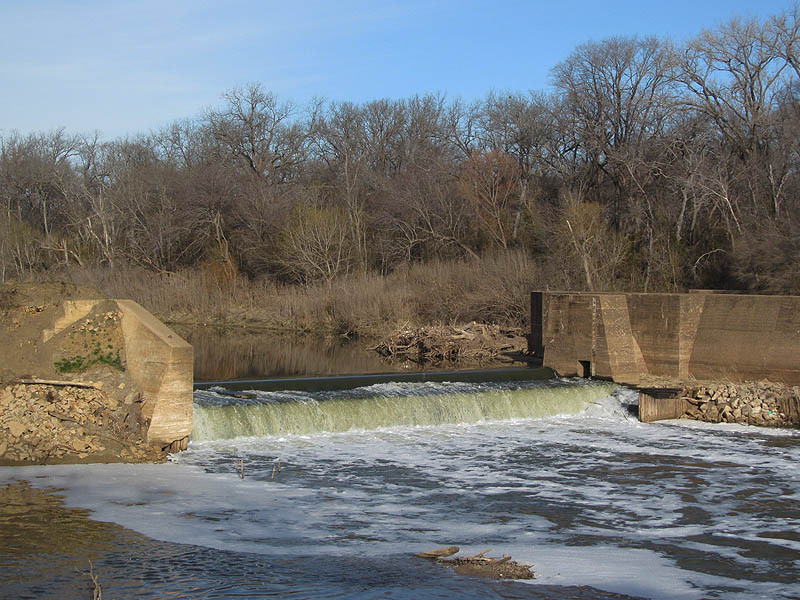 The dam creates a small waterfall on the Trinity River. 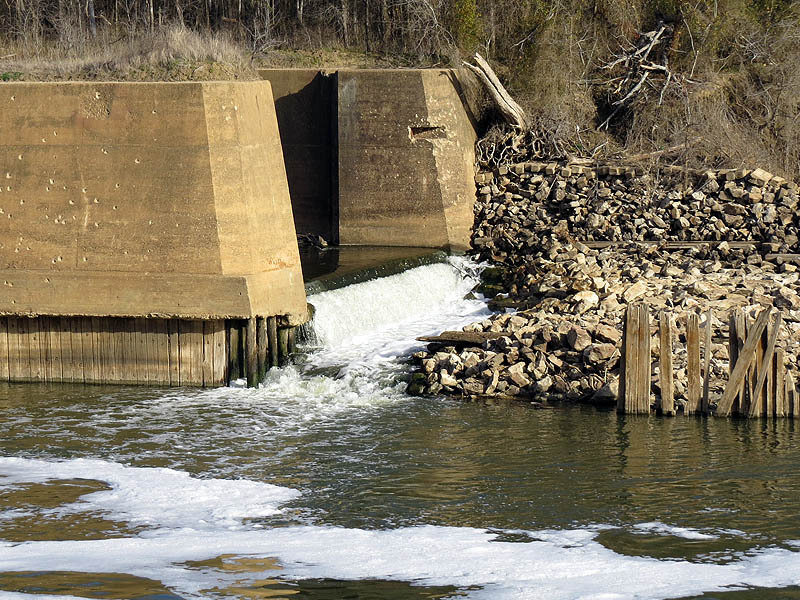 A closer look at the dam. Standing on the west bank of the river. Looking downstream from the lock and dam. 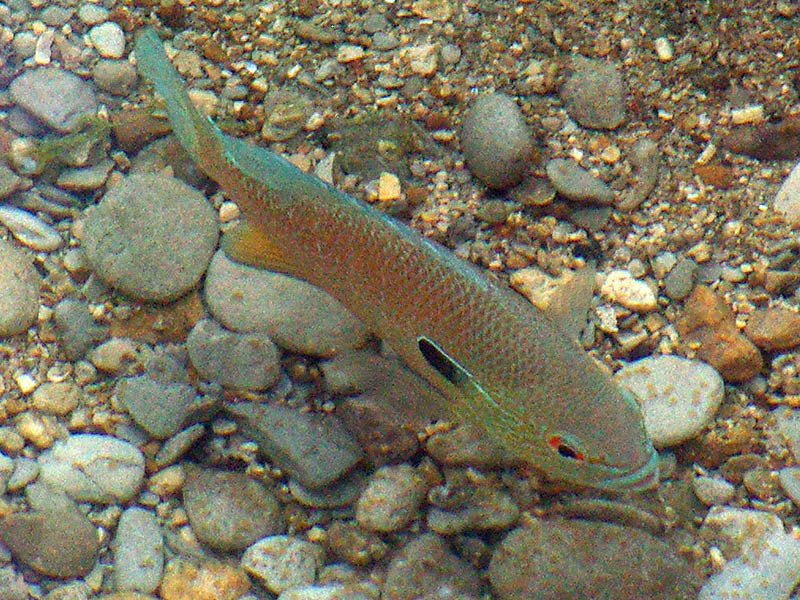 The rusty and bullet-riddled carcass of a 1980s model Chevy pickup sits locked in the grasp of a sandbar just down stream from the dam. In between, Eastern Bluebirds were congregating on a gravel flat, and gathered around around a small pool for a morning drink. A Chevrolet Pickup truck in the Trinity River. 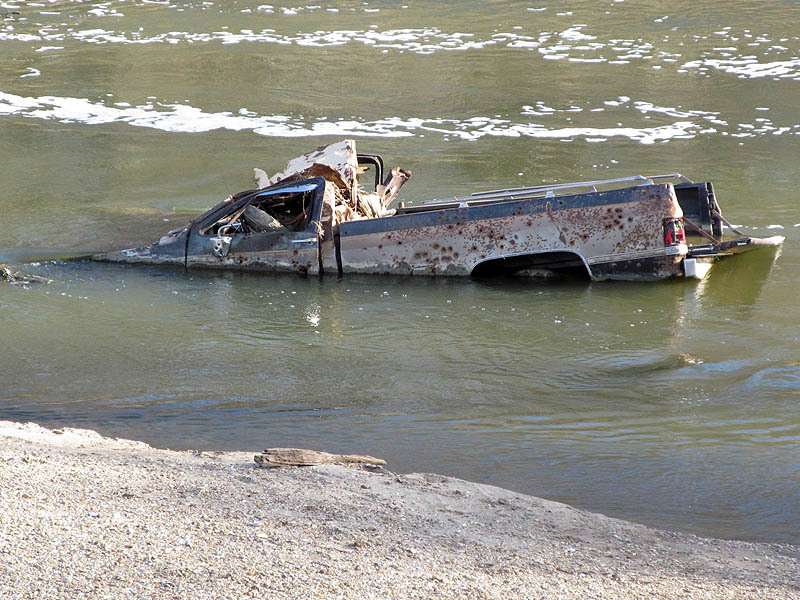 There is no telling how or where this bullet-riddled truck found its way into the river. 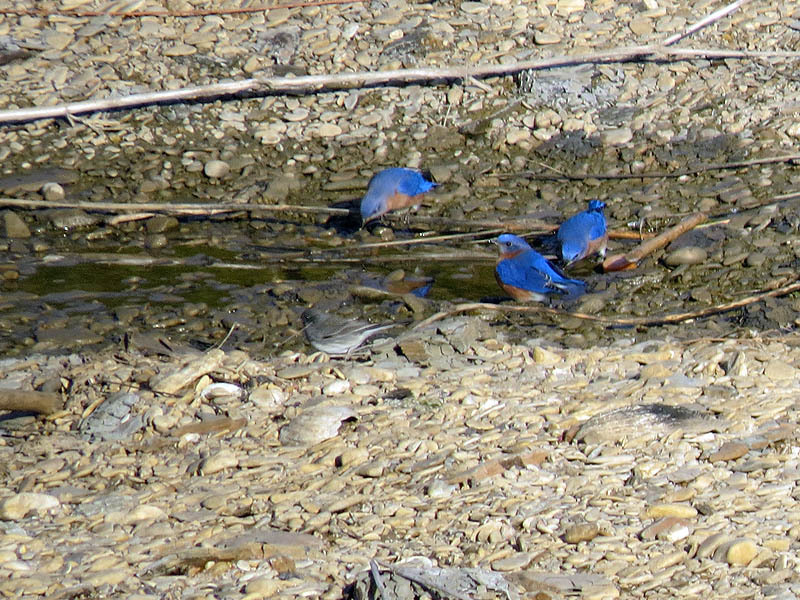 Eastern Bluebirds drinking near the river. The Lock and Dam itself is fascinating to see. 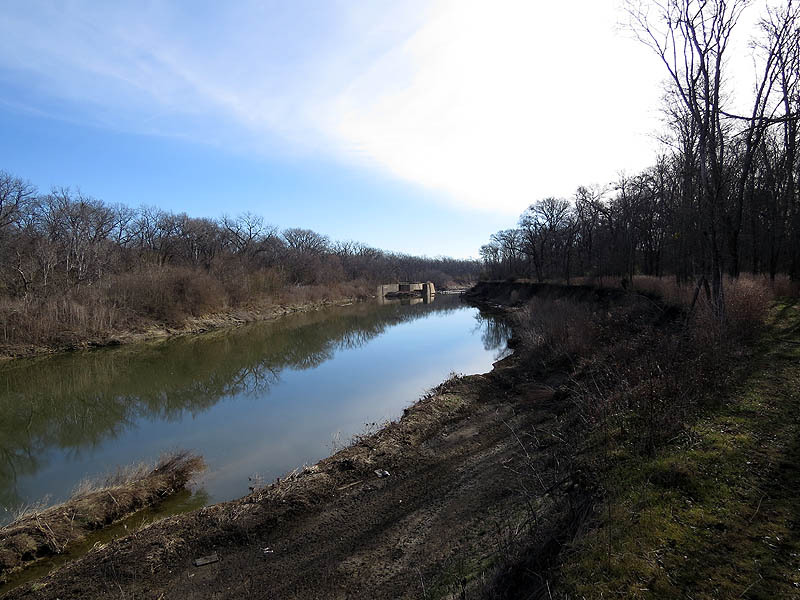 The low water level at this spot reveals more of the underlying structure than at our other two lock and dams. It looks as if timber retaining walls provide the foundation for the entire construct. 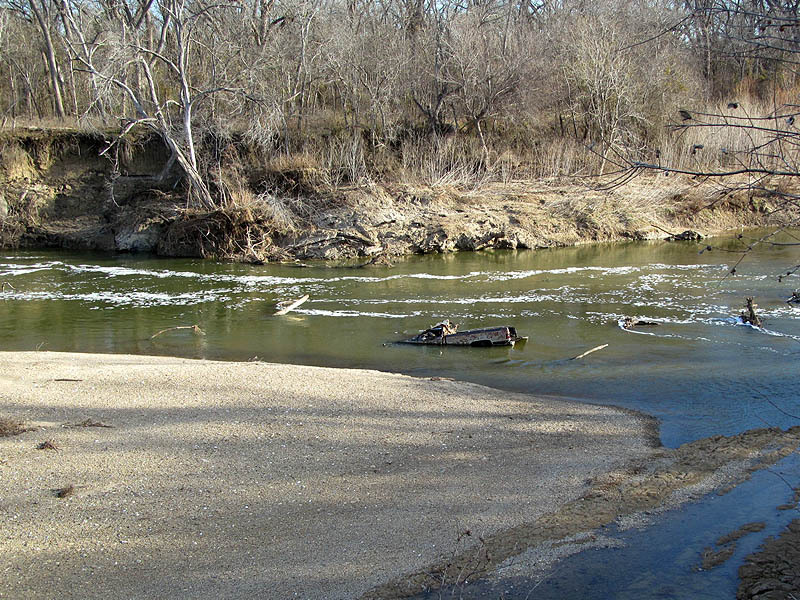 These wooden relics appear to be in amazingly good shape after spending a century buried in the mud of the Trinity River. 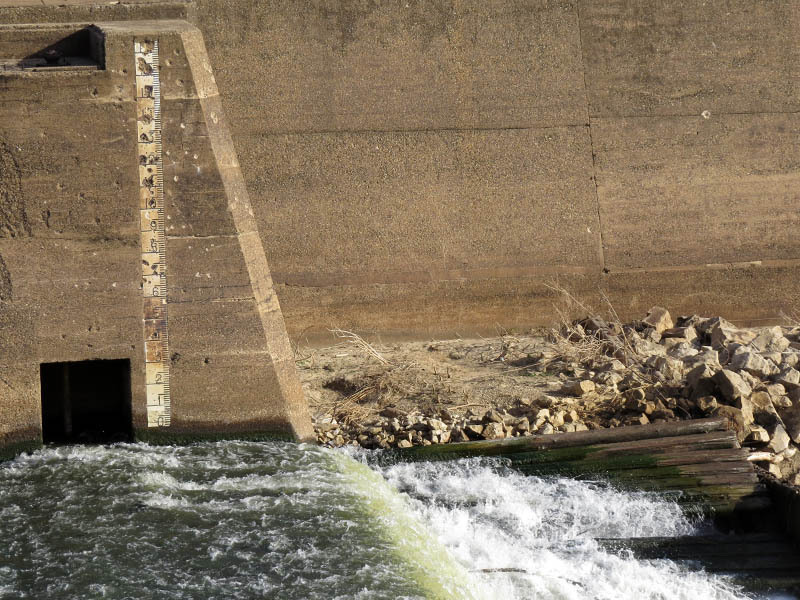 It will be interesting to see what happens to the lock and dam if and when these walls ever begin to fail. Notice the old timbers that make up the foundation of the concrete lock. 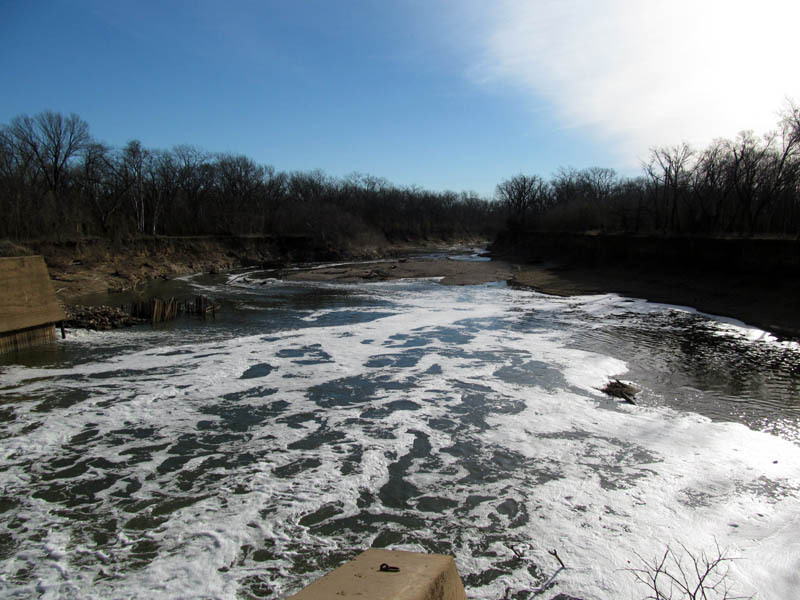 Trinity River water flowing through the lock. 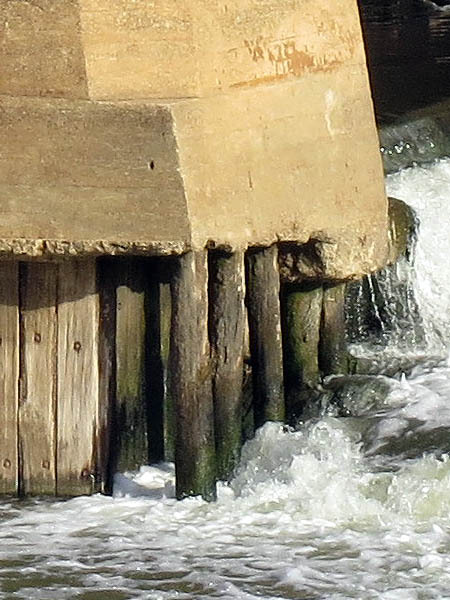 Wooden poles appear to be supporting the concrete at the south end of the lock. This was part of the mechanism used to raise and lower the dam. The sides of the lock were also bullet-riddled. 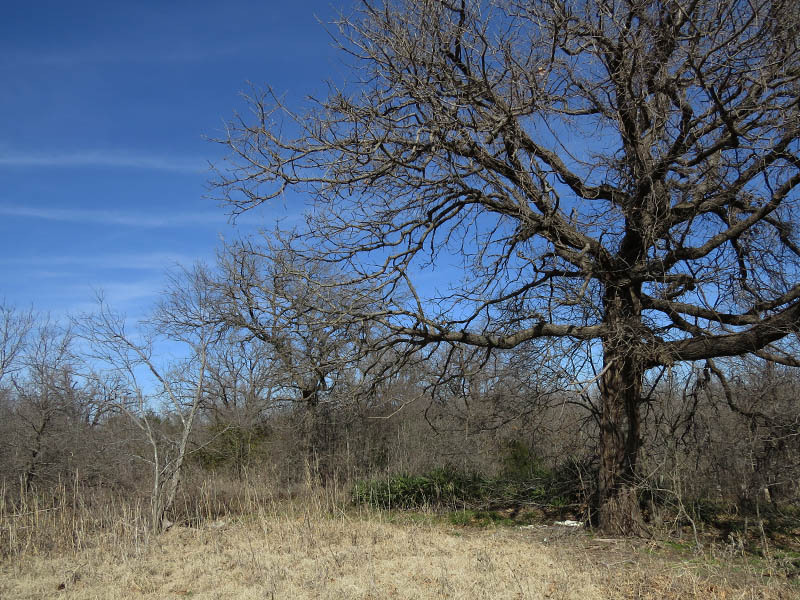 Guns and Texas go hand-in-hand, and much ammunition has been expended at this location. 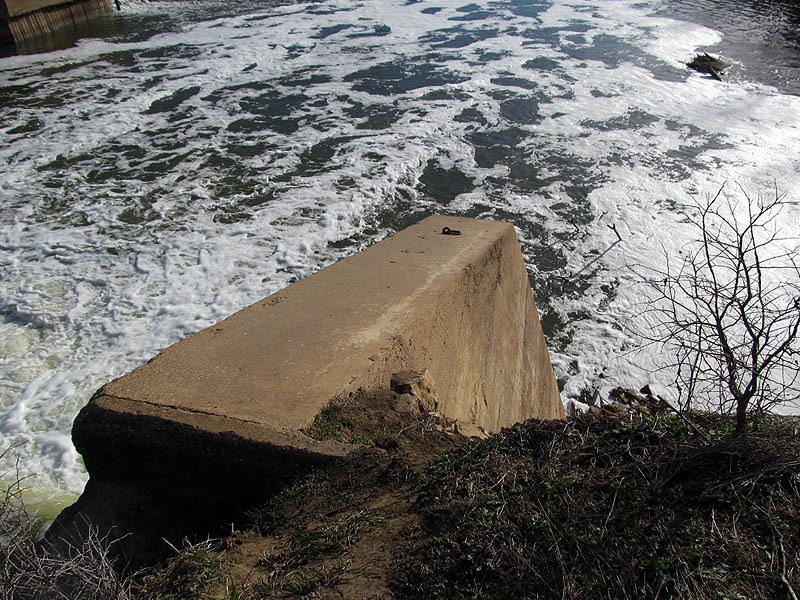 A particularly ambitious vandal even went to the trouble to shoot out almost every tile on the dam’s depth gauge. 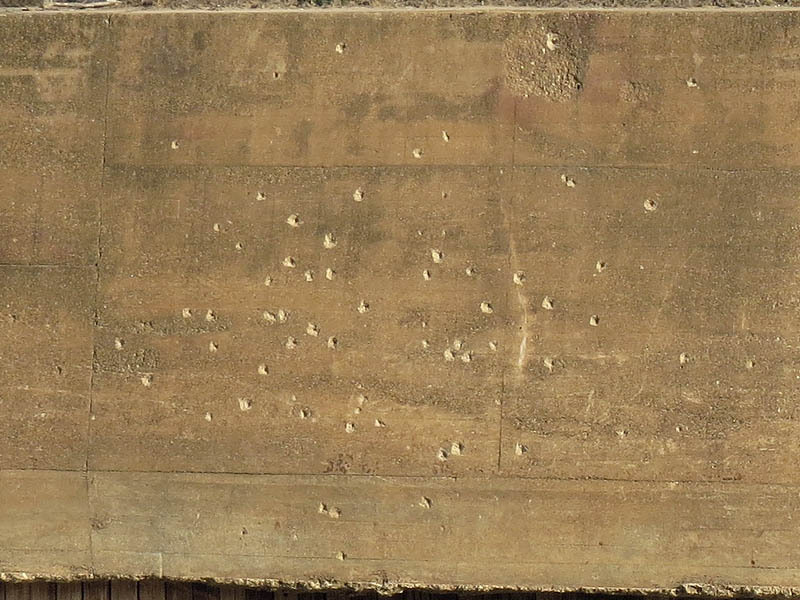 The walls of the lock have been used for target practice. The depth gauge is pretty shot up too. Moving on we headed back to the north for a quick visit to Goat Island. 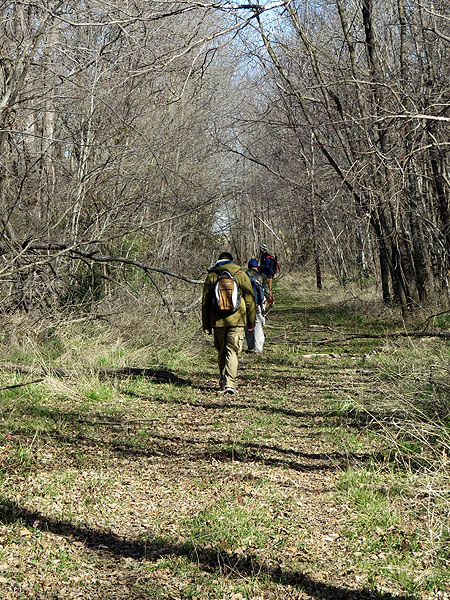 As planned, we took the low road back, following the banks of the river for several hundred yards before we reentered the woods. The hike along this route was mostly uneventful. Other than the enjoyable scenery the only other thing we found of note was an abandoned—and likely illegal—hog trapping pen. 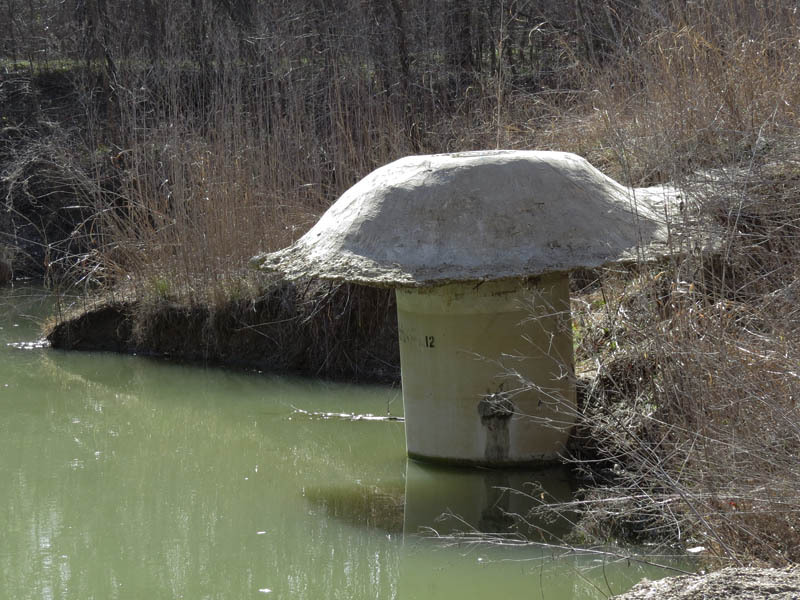 This kind of thing is ubiquitous in the wilds along the Trinity River. Leaving Lock and Dam Number Two. The river water behind the lock and dam was mirror-smooth. Heading north along the river. 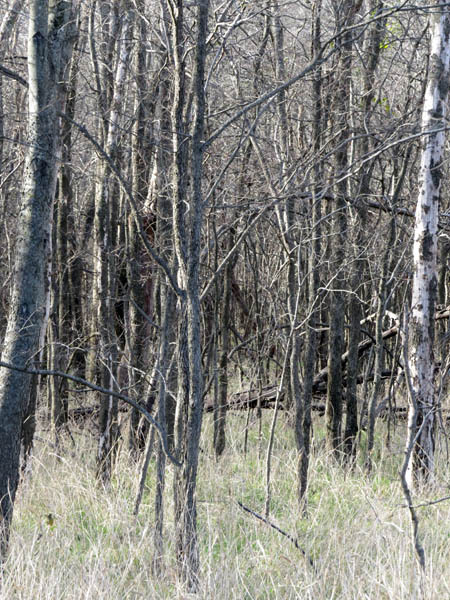 This is what the terrain looked like through this part of the preserve. 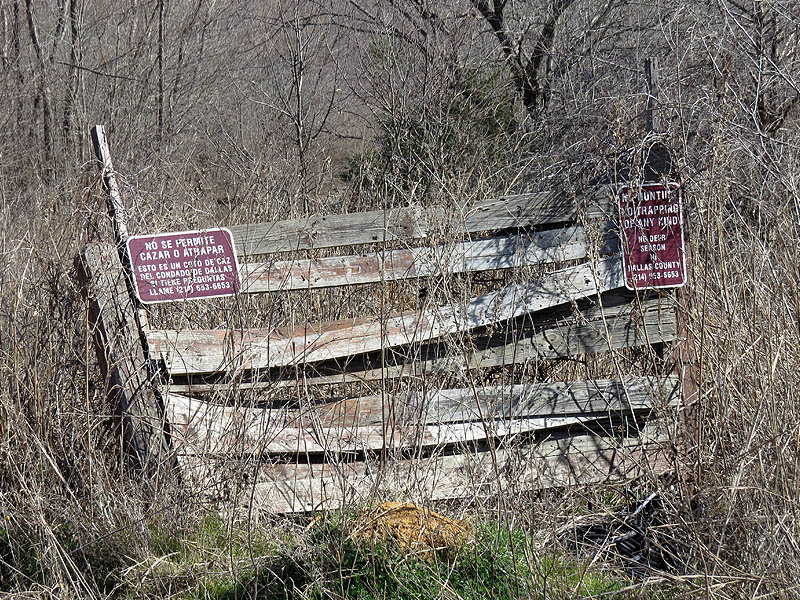 A hog trap located within the boundaries of the county preserve. 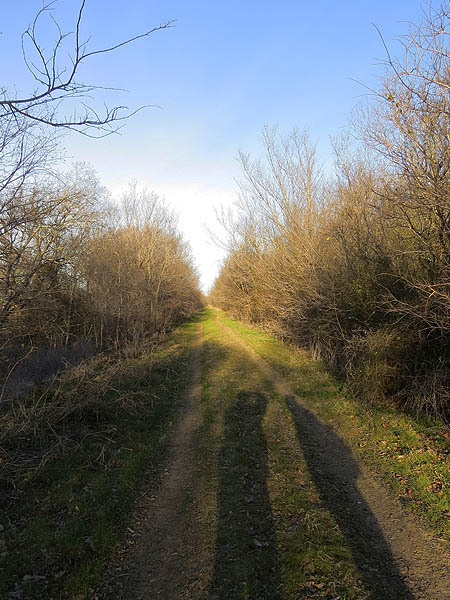 Soon we were back to the place where we accessed the levee trail. 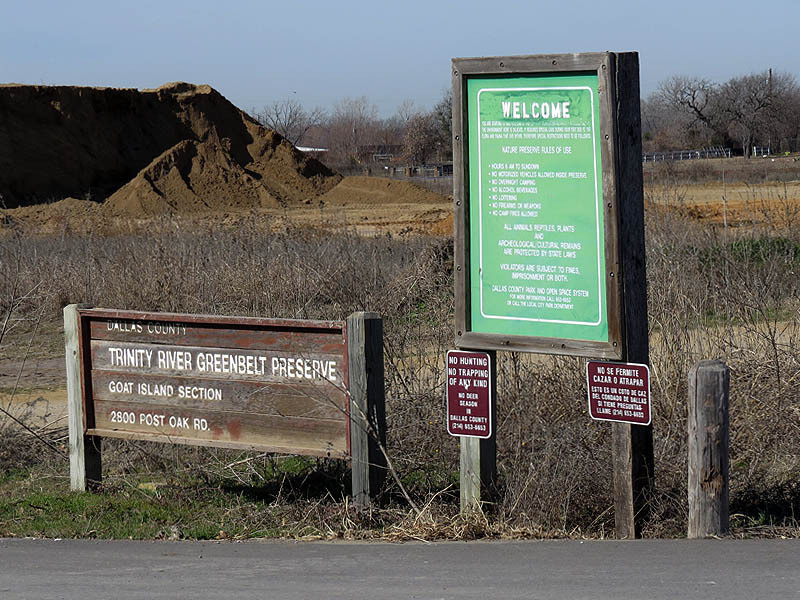 This time we took the path to the east and made our way to Goat Island and the Trinity River. A small creek separates the island from the mainland, but the dry conditions made crossing a breeze. Along the way you might notice the biggest mushroom ever. Keep your eyes peeled! 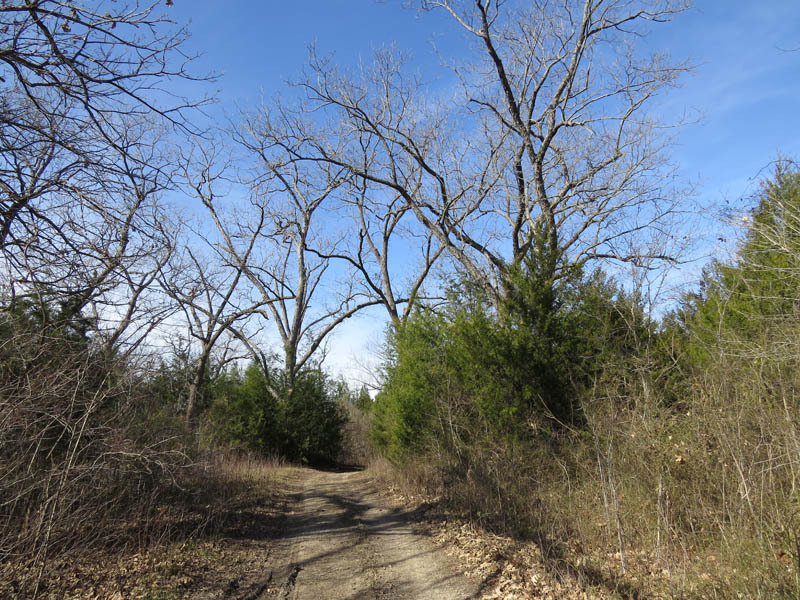 The trail leading to Goat Island. The creek crossing leading to Goat Island. After a quick visit to the river we headed back for the cars. The weather had warmed significantly over the course of the morning, and we were all beginning to shed our hats and gloves. With no place to stow our heavy coats we had to make do with just unzippering them. It really is amazing how rapidly the weather conditions can change in North Texas. 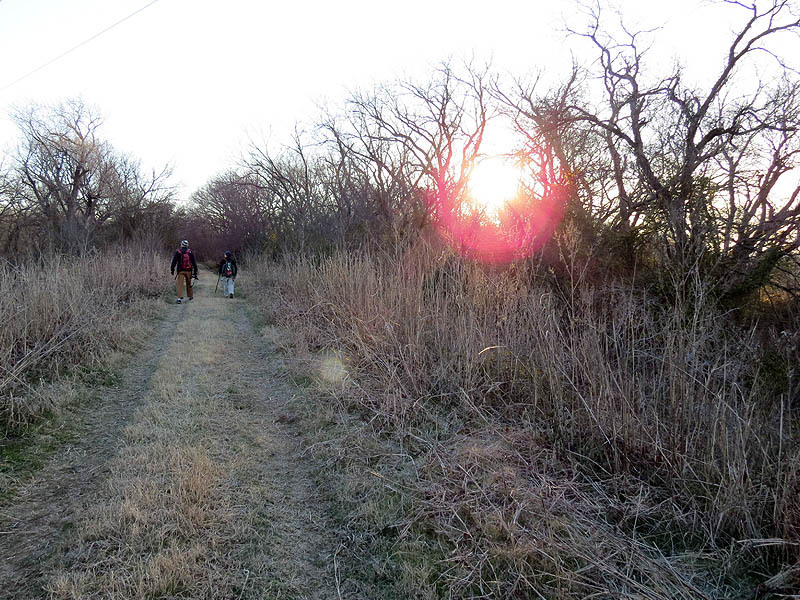 Crossing Goat Island on the way to the Trinity River. 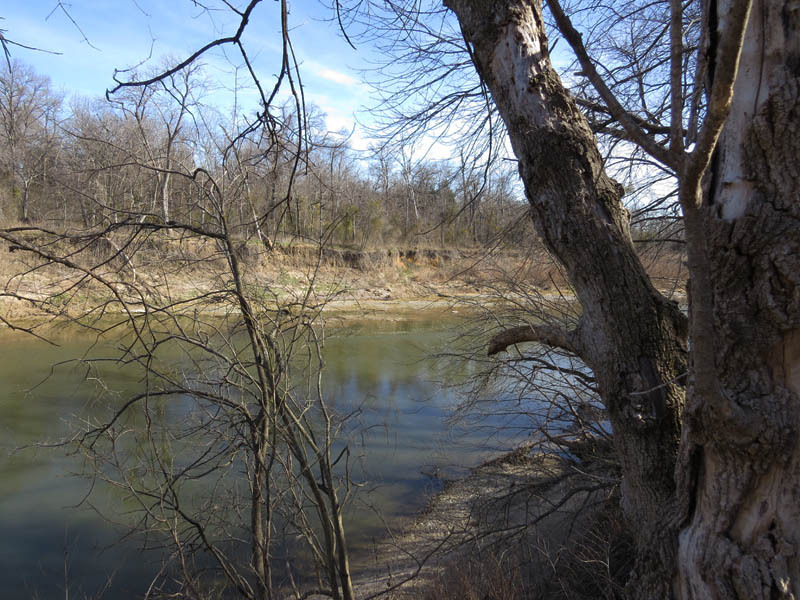 The Trinity River at Goat Island. The way back to the trailhead. 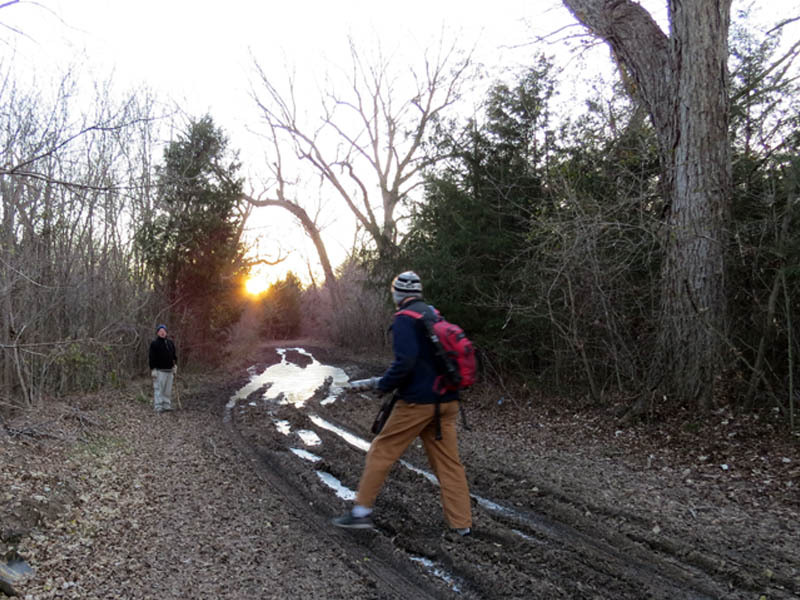 As we made our way back to the parking lot we again encountered the section of trail with the frozen pools of water—only now the ice had thawed and we were faced with soft and sticky mud obstacles that had to be bypassed. In some places skirting the trail was easy enough. 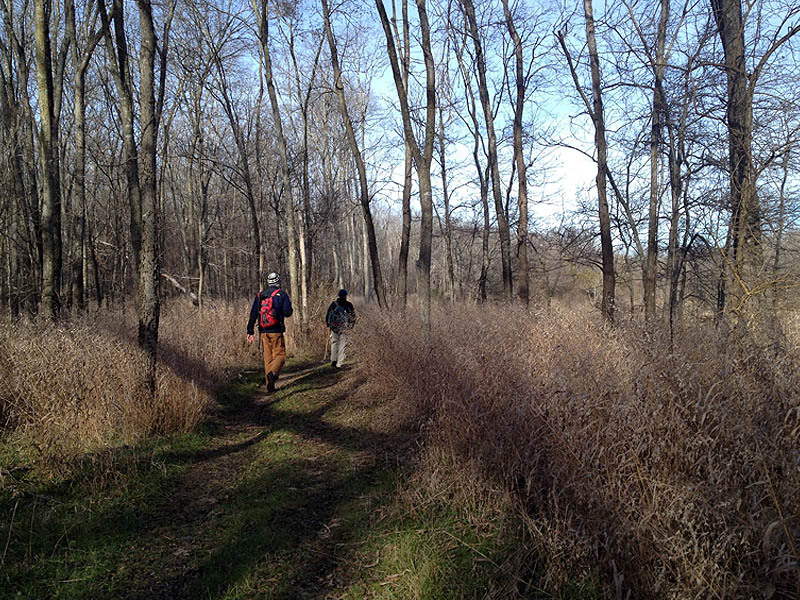 In others a little bushwhacking was required. 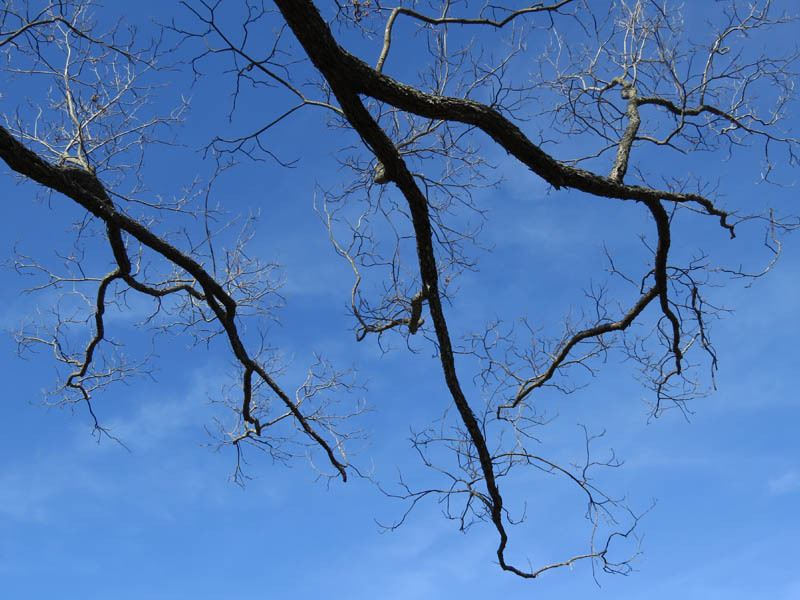 It was a beautiful day to be outdoors. The temperatures rose steadily as the morning wore on. Not much wildlife was seen on this trip. 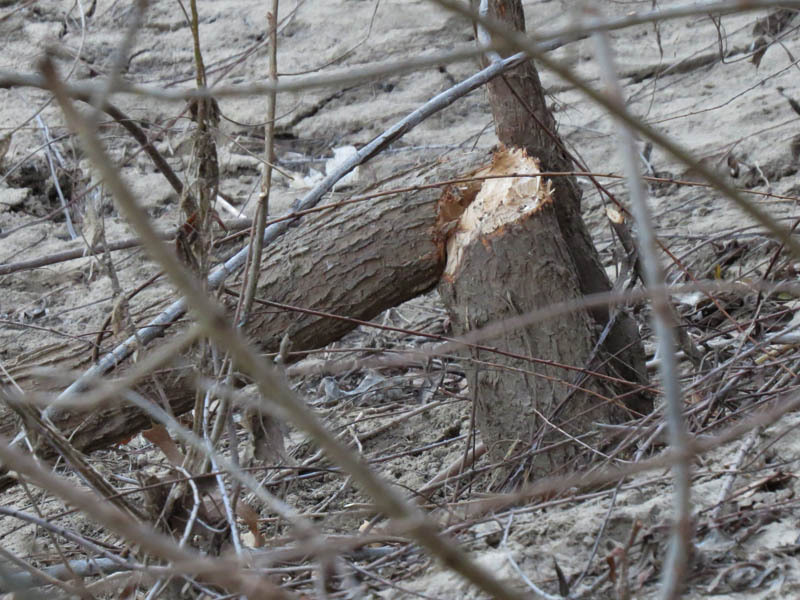 We found some evidence of Beavers near the river. 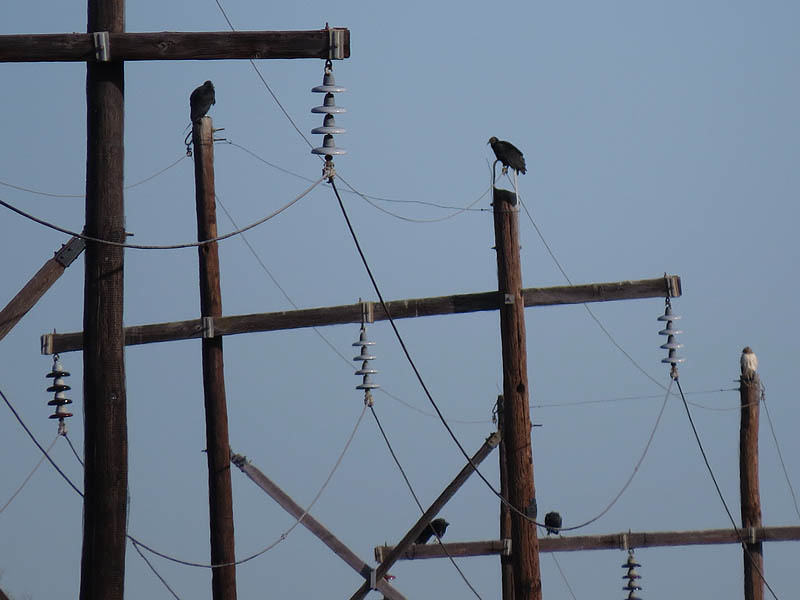 A few Black Vultures gathered on some power lines. 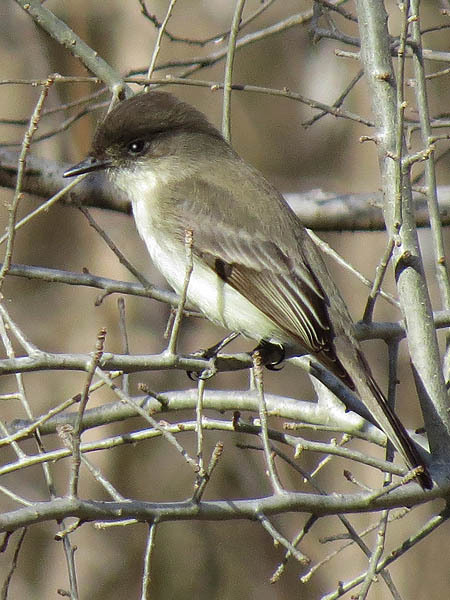 An Eastern Phoebe was seen flittering through the underbrush along the riverside trail. 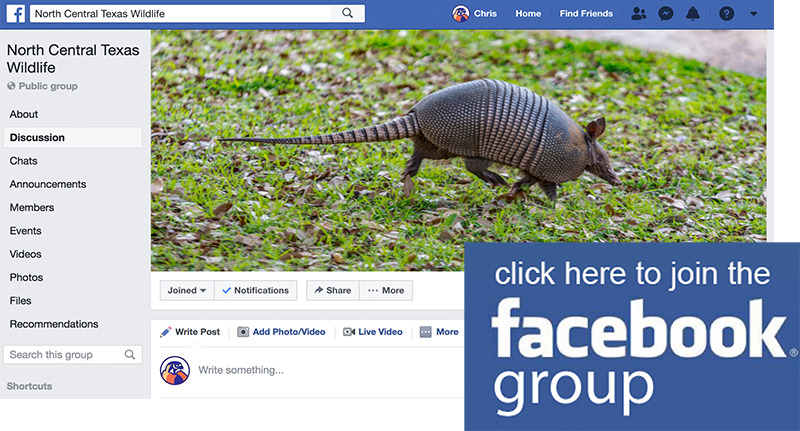 We had a brief look at a roaming coyote, and we may have flushed a sounder of Feral Hogs we we stopped to examine an unusual growth of yucca. Beaver sign near the Trinity River. 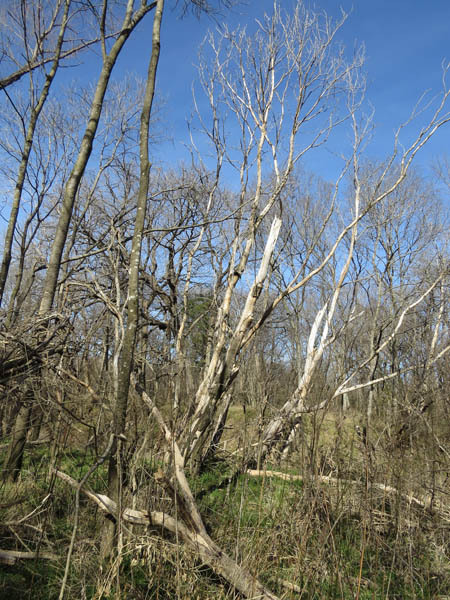 This is were the industrious Beaver had dragged branches into the river. Black Vultures atop utility poles. Do you see the Red-tailed hawk perched with them? 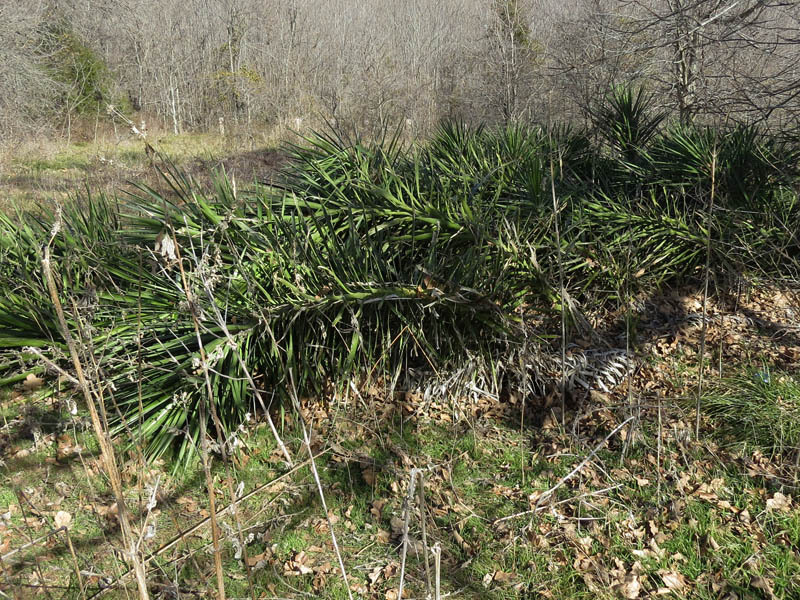 We heard a number of large animals move further into the brush when we stopped to examine this unusual yucca plant. Great article, the bluebird photo really looks awesome. Thanks, Ben. Looking forward to getting back out there when its a little greener! 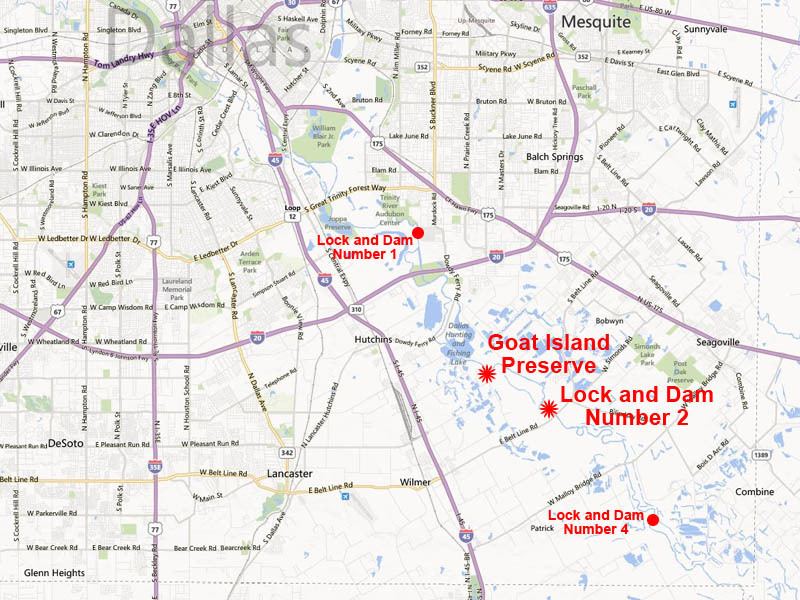 I’ve been searching for a way to reach lock & dam number four but it doesn’t seem to be on any established trails. 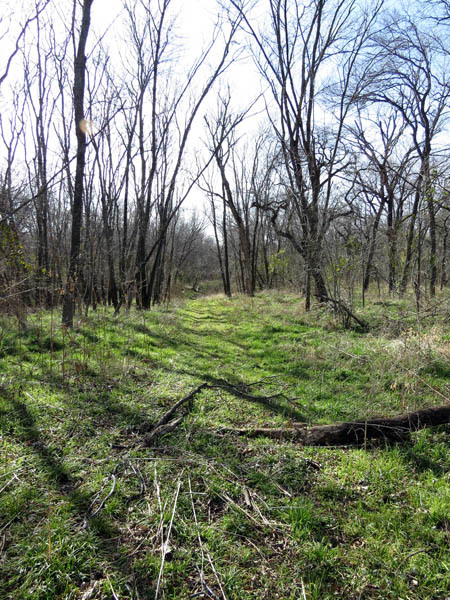 Is there a way that doesn’t encroach on private property?